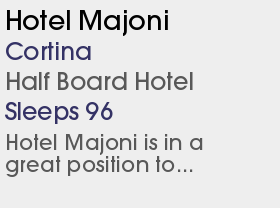 1 Chalet Hotel and 3 Half Board Hotels. Cortina d'Ampezzo, set to the East of the Sella Ronda circuit, is known as the 'Queen of the Dolomites'. 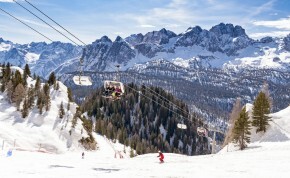 It is renowned for the excellent selection of skiing as well as superb accommodation, bars, restaurants and shopping. 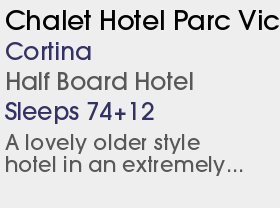 Cortina is pure Italian style! Most Italians don't even go to ski - it's a place to shop, be seen and most importantly to lunch. Lunch here is a serious event and the slopes are often empty after 2pm! Skiing in Cortina includes the main ski areas of the Cortina Cube (Crystal, Faloria and Mietres), Tofana, and Lagazuoi-5 Torri, with plenty of challenging runs as well as some of the most amazing views. All the areas are either linked by the great network of lifts or local skis buses. The Tofanas Ski Area's accolade is the famous women's downhill world cup run. 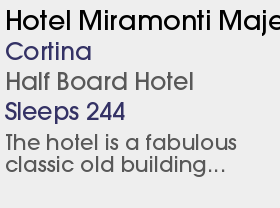 Cortina hosts this famous event in January and has done for the past 18 years. The well-groomed pistes are perfect for beginners and with 95% of the slopes having snow making facilities, intermediates will also enjoy their ski holidays in Cortina. The local skiing for those on ski holidays in Cortina is extensive and varied with other resorts such as S.Cassiano and Corvara in the Dolomiti Superski area easily reached in 30 minutes from the Falzarego pass. Most visitors will do the Sella Ronda route either clockwise or anti-clockwise and make a day of it. It is easier and 'cruisier' going clockwise but good skiers should opt to go anti-clockwise for more challenges and greater views. The Canalone Tofana slope is being opened up. The Faloria rifugio has the addition of new ensuite rooms and an a la carte restaurant, making it a an inviting option for staying on the slopes. In town there is a lovely new wine bar, Baita Fraina, sister to the restaurant of the same name. And the 4-star boutique hotel Ambra re-opened after refurbishment.